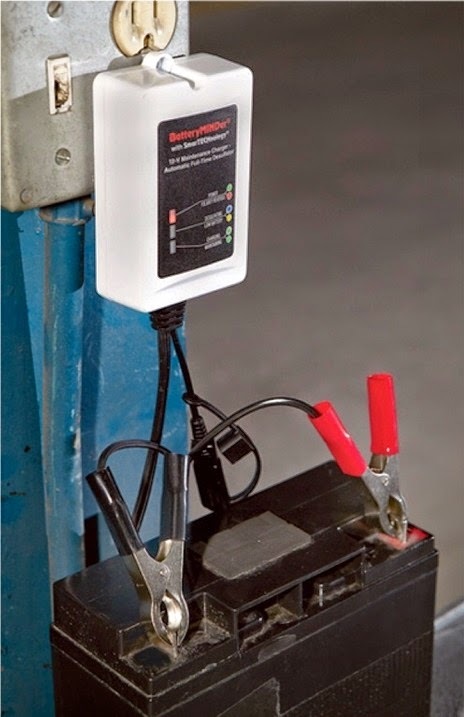 The BatteryMINDer 1500 is a 12V, 1.5 Amp Maintenance Charger & Desulfator that uses a SmarTECHnology microprocessor to configure its operation. It is able to support up to four batteries at once and avoids over or under charging a battery by temperature compensation. The 1500 can extend an RV's battery life up to four times through high frequency pulse desulfation. The charger’s 5 stages can keep batteries fully charged, even when they are not being used. It is able to recover weak batteries and features protection from reverse polarity and short circuits. The 1500 is Energy Star rated for efficiency and electricity usage. Safety is key when using any type of electrical charger and the BatteryMINDer 1500 is no different. It is important to remember to check the battery and make sure it is fully charged before connecting it together with another battery. It should not come in contact with any type of water. When you are done using the BatteryMINDer, it should be unplugged by pulling on the plug, rather than pulling on the cord. The 1500 should not be used if it has any damage or has been dropped. If maintenance is required, make sure the 1500 is unplugged and not in use. When charging a battery make sure the BatteryMINDer is as far away from it as possible, and do not set it on top of a battery. The 1500 is not meant to be used for aviation or lithium batteries.